On the evening of Monday, November 29, a series of severe storms swept through Louisiana, Mississippi and Alabama, and hams provided support from the National Weather Service office in Jackson, Mississippi. According to the NWS, seven tornados were embedded in the storm system, with at least six counties reporting damage. There were no deaths in the latest storms, though 15 people were hurt in Mississippi and buildings were badly damaged there and in Louisiana. Schools were closed in Alabama and tornado watches were posted in Tennessee and parts of North and South Carolina on Tuesday as the storms moved east. Read more here. The ARRL filed an ex parte submission with the FCC on November 30, providing additional support for its position that the FCC should require mandatory notching of the amateur bands by Broadband over Power Line (BPL). The ARRL's filing stated such devices can cause harmful interference to Amateur Radio operators, and requested that the FCC "establish rules that are appropriate for unlicensed BPL systems and which minimize the interference potential." After the FCC released its Request for Further Comment and Further Notice of Proposed Rule Making in July 2009, the ARRL filed comments and reply comments and made oral and written ex parte filings, urging the adoption of Part 15 Rules which reflect both the capabilities and practices of the bulk of the BPL industry, and which are sufficient to protect licensed radio services in the HF and VHF bands. "It has been painfully apparent that the present rules permit the deployment of BPL in configurations which cause severe, ongoing harmful interference if operated on radio spectrum that is in use locally," the ARRL asserted in its filing. The ARRL, in its numerous filings on this issue has "strenuously urged" the FCC to require full time, mandatory notching of all amateur allocations to at least 35 dB notch depths. "This level of notching is both achievable by present BPL systems and is typically, but not universally, implemented by the BPL industry." Read more here. After more than 160 days in space, ISS Expedition 25 Commander Doug Wheelock, KF5BOC -- along with Flight Engineers Shannon Walker, KD5DXB, and Fyodor Yurchikhin, RN3FI -- has returned to Earth from the International Space Station (ISS). Their Soyuz spacecraft landed in Kazakhstan on Friday, November 26. While on board the ISS, both Wheelock and Walker participated in the Amateur Radio on the International Space Station (ARISS) program, and made 22 ISS-to-school and ISS-to-camp QSOs. In addition, Wheelock averaged about two dozen casual QSOs each week while on board the ISS. Read more here. The highest of the HF bands will be the central operating focus of many amateurs in the ARRL 10 Meter Contest, December 11-12. During the event, many propagation modes will be available: Sporadic-E will help you work stateside stations, a touch of meteor scatter in the morning will give you split-second chances to work stations -- you'd better be quick, though! 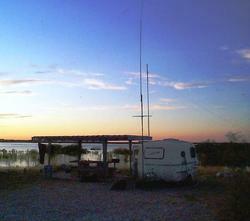 -- and DX stations could find their way into the log, thanks to some recent signs of life from the F-layer. "Ten meters was open from the United States to Africa, Europe and South America during the CQ World Wide DX CW contest on the weekend of November 27," said ARRL Contest Branch Manager Sean Kutzko, KX9X. "Let's see if those conditions remain for the second weekend in December." Read more here. The 37 operators from 15 countries who make up the DX0DX DXpedition Team that will go to the Spratly Islands is finalizing preparations for the almost month-long DXpedition that begins January 6, 2011. Instead of going by boat, the team will instead fly to Thitu Island where they will set up their operation. Thitu is the second largest island in the Spratly Islands. The Spratlys are a group of more than 750 reefs, islets, atolls, cays and islands in the South China Sea between Vietnam, the Philippines, China, Malaysia and Brunei. They comprise less than 4 square kilometers of land area, spread out over more than 425,000 square kilometers of sea. Read more here. This feature is a concise monthly update of some of the things ARRL is doing on behalf of its members. This installment -- which covers the month of November -- includes ARISS activities ; new licensing exam software; elections of Board members and Section Managers; and on-the-air events. Read more here. The end of 2010 is fast approaching and ARRL is poised to close the books on December 31! Many members wait to make contributions at the end of the year -- these contributions are important to the ARRL funds that are not supported by member dues. But wait! There's more! When you make a contribution of $30 or more before December 31, you'll receive a complimentary $10 gift certificate* on your next publication sales purchase at ARRL. You can make your gift on our secure Web site, by mail or by phone at 860-594-0397 and we'll send your $10 gift certificate right away. You may decide to make a monthly credit card contribution of $10 or more on the ARRL Web site to support one of the areas listed above. For more information, contact ARRL Chief Development Officer Mary Hobart, K1MMH, via e-mail or by phone at 860-594-0397. Your year-end contribution is tax deductible to the extent allowed by law. ARRL is an IRS designated 501(c)(3) organization holding tax identification number 06-6000004. * About ARRL Gift Certificates: After making your contribution of $30 or more, your $10 ARRL Gift Certificate will be promptly mailed to you. Certificates must be redeemed by April 30, 2011. It is easy to redeem your certificate online, by mail or phone. This offer is valid on all sale and regular-priced ARRL publications. Clive McMurray of the British town of Hull (located about 45 miles southwest of York) was convicted and sentenced on November 22 for causing deliberate interference to Amateur Radio users and unlawfully using radio equipment without a license. According to the Radio Society of Great Britain -- that country's IARU Member-Society -- McMurray caused interference to operators in the Hull region of Humberside between June-November 2009. Read more here. On November 23, the FCC issued a Citation to Hobby Lobby International (HLI) for marketing non-compliant radio frequency devices. According to the Commission, these devices were in violation of Section 302(b) of the Communications Act of 1934, as Amended and Section 2.803(a)(1) of the Commission's Rules. In July 2009, HLI was also issued a Citation for the same reason. This time, HLI was found to be selling an unauthorized radio frequency device, specifically the JETI Duplex 2.4 GHz System for radio-controlled models. 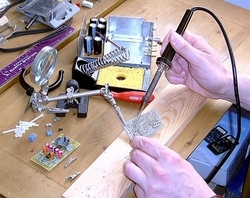 This system consists of a transmitter and receiver used for remote control of model aircraft, boats, and cars. The FCC Citation warned that if, after receipt of the Citation, HLI violates the Communications Act or the Rules "by engaging in conduct of the type described herein, the Commission may impose monetary forfeitures...as well as criminal sanctions, including imprisonment." HLI has 30 days to respond to the Citation, either through a personal interview at the FCC office in Atlanta or via a written statement. 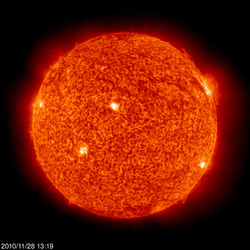 The Sun, as seen on Thursday, December 2, 2010 from NASA's SOHO Extreme Ultraviolet Imaging Telescope. This image was taken at 304 Angstrom; the bright material is at 60,000 to 80,000 Kelvin. Tad "Holding you close is like holding the summer Sun" Cook, K7RA, reports: The average daily sunspot numbers for the seven days -- November 25 through December 1 -- were up 1.3 points to 25.9, compared to the prior seven day period. The predicted solar flux for the next 10 days, December 2-11 is 88, 90, 90, 90, 88. 88. 86, 86, 85 and 85. The predicted planetary A index for the same period is 5, 10, 8, 7, 5, 5, 5, 5, 5 and 7. The three-month moving average of daily sunspot numbers changed from 28.9 to 33 and 35.6 for the periods centered on August, September and October (ending in September, October and November). This shows a continued slow upward trend in sunspot activity. Look for more information -- including some news on Long Delayed Echoes (LDE) -- on the ARRL Web site on Friday, December 3. For more information concerning radio propagation, visit the ARRL Technical Information Service Propagation page. This week's "Tad Cookism" is brought to you by Billy Joel's This Is the Time. 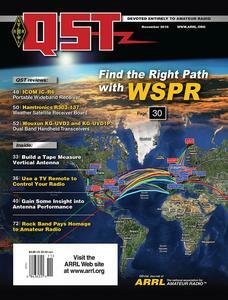 The winners of the QST Cover Plaque Award for November are Joe Taylor, K1JT, and Bruce Walker, W1BW, for their article "WSPRing Around the World." Congratulations Joe and Bruce! The QST Cover Plaque award -- given to the author or authors of the best article in each issue -- is determined by a vote of ARRL members on the QST Cover Plaque Poll Web page . Cast a ballot for your favorite article in the December issue today. This video by Henk Kamoen, PA3GUO, describes how to receive and decode telemetry from the O/OREOS satellite that was launched from Kodiak Island last week. Click here to view.